are best described as a hip-hop jazz outfit. They&apos;re members of the Jazz Mafia collective, and they&apos;re not afraid to get political. The Shotgun Wedding Quintet on the Garden Stage at the Monterey Jazz Festival. Photo by Mike Rainey. Pulling in influences from ska to reggae to klezmer, the Shotgun Wedding Quintet could be viewed as just another novelty band. To make that assumption, however, would miss one important thing: they&apos;re ferociously talented. 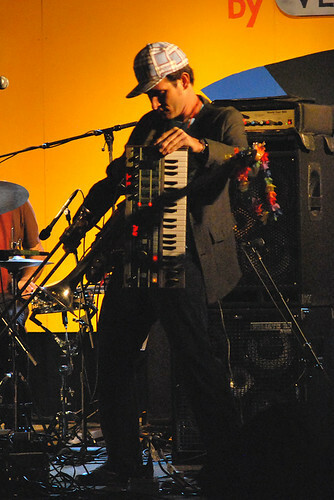 Adam Theis of the Shotgun Wedding Quintet plays his bass with his keyboard and trombone. Photo by Mike Rainey. This talent is best exemplified by Adam Theis, who brings new meaning to the term "one-man band." Theis would play several notes on his bass, loop them through an effects pedal, then play trombone to his own accompaniment. As if this wasn&apos;t enough, he then used his keyboard and trombone (yes, the physical instruments) to play his bass. One audience member, who had likely just seen Jason Moran play piano with a beer bottle, whispered, "Apparently this is &apos;get freaky with the jazz&apos; night." 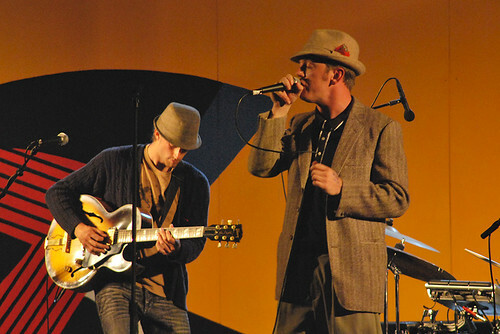 The Shotgun Wedding Quintet featuring vocalist Dublin (R) at the Monterey Jazz Festival. Photo by Mike Rainey. The Shotgun Wedding Quintet&apos;s dark, sharp-edged, often funny lyrics detail the daily trials of San Francisco life, from the girlfriend that&apos;s "too hip to live" to the frustrations of being used as a derogatory example on the national political stage. Their solid beats had people dancing in front of the stage. They were a Sunday night standout at the Monterey Jazz Festival. 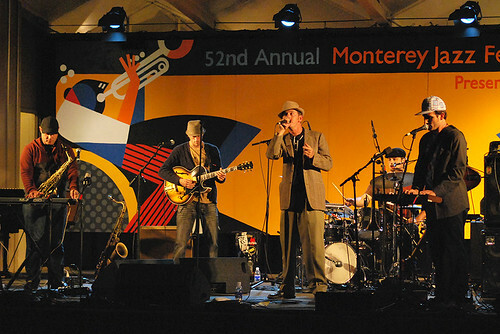 For more coverage of the Monterey Jazz Festival, see our Monterey Jazz Festival category.